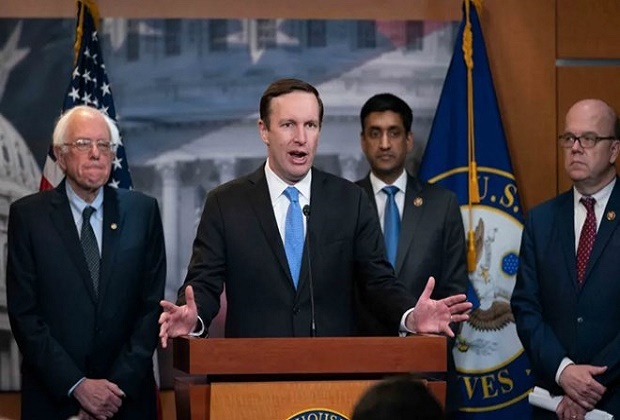 US lawmakers voted Thursday to end military support for the bloody Saudi-led war in Yemen, dealing a harsh bipartisan rebuke to Donald Trump and taking the historic step of curtailing a president’s war-making powers. The House of Representatives voted 247 to 175, with one congressman voting present, to approve a resolution that directs the president “to remove United States Armed Forces from hostilities in or affecting the Republic of Yemen” within 30 days. The White House has called the measure “flawed” and warned it would harm bilateral relations in the region, including with Saudi Arabia. But the passage through Congress marked a historic milestone, as it was the first time in history that a measure invoking the 1973 War Powers Resolution will reach the president’s desk. Several Democrats have argued that the US involvement in the Saudi-led coalition fighting Huthi rebels — mainly through the provision of military aid such as the refueling of aircraft — is unconstitutional without congressional authority, and they have sought for months to reclaim US lawmakers’ constitutional authority to declare war. “Today we took a clear stand against war and famine and for Congress’s war powers by voting to end our complicity in the war in Yemen,” Senator Bernie Sanders, a lead author of the resolution and a 2020 presidential candidate, said after the House vote. “The president will have to face the reality that Congress is no longer going to ignore its constitutional obligations with regard to foreign policy,” House Foreign Affairs Committee chairman Eliot Engel told the chamber. At least 15 House Republicans joined Democrats in defying Trump on Yemen, where critics of American intervention have warned that Saudi forces are likely using US weapons to commit atrocities. The United States provides weapons and refueling to the Saudi coalition. It is also likely to trigger the second veto of Trump’s presidency. Last month he overrode a congressional resolution that aimed to reverse the border emergency that he declared in order to secure more funding for his wall between the United States and Mexico. The Yemen vote, and the rare bipartisanship at the heart of it, came as US lawmakers have escalated their opposition to Saudi Arabia after the October murder of Saudi journalist Jamal Khashoggi at the kingdom’s consulate in Istanbul. Republicans and Democrats alike have bristled over the White House’s apparent embrace of the kingdom and its leadership. Some members of Congress have publicly stated that they suspect that powerful Crown Prince Mohammed bin Salman was directly responsible for the killing, based on the CIA’s conclusions. But congressman Michael McCaul, the top Republican on the foreign affairs panel, warned the resolution does “nothing” to address the humanitarian crisis in Yemen or deliver justice for Khashoggi’s murder.